Now I know how one of my sisters-in-law felt when I asked her not to turn baby Big Guy on his belly while he slept. Her youngest child was only 6, and her pediatrician always had told her belly was best, she said. Otherwise, they’ll choke on spit-up and die, she warned me. Aside from the fact that her last point was an exaggerated leap in logic, she was right as far as it went. Problem was, her advice was 6-years-old and a lot had changed since then – chiefly, years of additional research that led to the Back to Sleep campaign that’s credited with greatly decreasing cases of Sudden Infant Death Syndrome. I’m in the same position today with the growing evidence that keeping children in rear-facing car seats until they’re 4 and 45 pounds is safer. That’s way different from the advice – indeed the law in most states – that was dished out when the guys were younger. The current recommendation is rear-facing until 1 and 20 pounds. Many parents miss that “and,” rushing out to switch the car seat the second the baby turns 1 as some sort of rite of passage. Well, no he’s not, because that’s all he knows. Just as a kid who remained rear-facing from birth through preschool wouldn’t know any different and wouldn’t be likely to complain. Now, I guarantee you Boots would scream bloody murder if I suddenly turned him back around – he’s not quite 4 and no where near 45 pounds. For that matter, Big Guy’s almost 6 and just cleared 45 pounds a few months ago. But it’s a battle I’d willingly fight if Boots’ birthday were more than a week or so away. Screaming bloody murder seems preferable to me to emerging bloodied from a car accident. Increasingly, that’s what research in the United States, England and Sweden shows: That keeping toddlers facing the back for far longer than we currently do helps prevent death and injuries. The American Academy of Pediatrics hasn’t officially endorsed rear-facing for toddlers, though it has issued statements encouraging rear-facing seats until at least age 2. The problem with the suggested 4/45 guideline is that many American car seats are approved for rear-facing use only until 35 pounds. In Boots’ case, that would easily get him to age 4, but he’s also small for his age. And I have to wonder seats at the approved 35-pound weight were designed mainly with hefty kids in mind. There’s a considerable difference in build between a plump 2-year-old and a kid pushing 4 whose legs would dangle out the sides of a rear-racing seat. I don’t know that the car seats were designed for heavier, rather than taller, kids, but neither can I find a photo anywhere of a 3-year-old sitting in a rear-facing seat. I also know getting any change in car-seat regulations signed into law is a battle. California safety advocates failed last year to convince the Legislature to pass a bill that would have required booster seats for children weighing up to 80 pounds. That’s in keeping with the American Academy of Pediatrics’ recommendations, though current California law requires boosters only for children under age 6 or 60 pounds. I hope he was kidding. Argument avoidance shouldn’t be a factor in making safety law in California or anywhere else. My 2 1/2 year old is 37 pounds and almost 39 inches tall. Her legs definitely dangle! There’s no way she could fit in there rear-facing. And I don’t really know how you’d design a car seat that would work that way. I’m sure somebody’s working on it, though! I tell you when I began to lose this battle – when their dad came back with them after a vacation in Cabo…and they had spent the entire week ‘sans’ car seat….GREAT…. My daughter is tall. Always has been. We kept her rear facing until she was one even though she was mushed in her car seat. I couldn’t fathom where she should put her legs if she was still rear facing. And I would love to see these studies of what happens to their legs because dangling off to the sides can’t be good. Jen, actually it’s not the length of their legs that is the problem. They can safely sit criss cross applesauce, and that is actually safer for them that way! Bent legs don’t break as easily. The main problem I found was the height requirements on the seats that we had. They both hit the upper height requirements for rear facing at right around 2 years old, and were flipped around at that time. LOTS of people thought I was mean or crazy, but I saw those videos of forward facing kids. I’d rather go through the hassle of keeping them rearfacing as long as possible, then to live with the knowledge that I could have done more to protect them and didn’t, KWIM? Looking back, Beckie, I could have easily made it to 2 with both my guys had I been more aware at the time. Three, maybe. Four, possibly as long as we were mainly on shorter rides. I just don’t know that it would have worked for longer trips. I totally can believe the 1/20 arguments, too. I catch grief today because Big Guy’s “still” in a booster and that one cracks me up in a “poking knitting needles through my eyebealls” sort of way. For one, he doesn’t meet either of the “ors” – 6 or 60 pounds – under California law. For another, even when he turns 6 in a month or so, he won’t be anywhere near 60 pounds soaking wet. And as far as height – which actually is a really important factor in boosters in particular even though California law doesn’t even look at it – forget it. Yet, relatives who couldn’t wait to “free” their child from a booster the second they turned 6 are appalled at the way I torture my child. I STILL haven’t found photos of rear-facing for older children in action, but I did find a photo of a Volvo car seat that looks about like I expected it to – cut-outs on the side for longer legs. That car seat can’t be sold in the US, btw, because it’s auto-brand specific. I am the only hold out in my family who insists on keeping my kids in car seats until 8 AND 80. Both. My oldest was rear facing until 16 months, when she hit 20 pounds. I could have left her rear facing awhile longer, but our car rides were long, and it just isn’t comfy to spend that much time folded like a pretzel. And I can’t imagine it’s good for their growing bodies either. (Though car accidents aren’t so great for growing bodies either!) If seats were designed to allow more legroom for tall kiddos I imagine there would be a little less resistance. My friend’s 4 year old is just now 22 pounds- she’s quite tiny for her age. We joke that she’s going to take her driving test in her booster because she still won’t make the required weight! LOL. My 4 1/2 year old is 45 pounds and 44 inches tall, but I kept him in a car seat with harness until late last year, when I began to fear that his size made the harness an unsafe option. Today, every time I strap him into that full booster seat (high back, with arms), I double check the seat belt and worry about how it would really perform on impact. I am STUNNED at the families that put their children in loosely or not at all. Looks like you’ve hit a nerve, Debra. 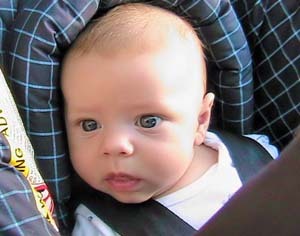 My son stayed rear facing until he was 3 and 33 lbs — the max rear-facing weight for his carseat. He fit rear-facing in the Britax Roundabout. He sat with his legs crosslegged. He never complained. He didn’t know any different. And it’s not just a matter of coming out of a car accident “bloodied.” The reason for kids to stay rear-facing is that their heads are too big and heavy for their necks. If you are ever in a front-end collision with your forward-facing toddler, there is a chance that they will come out of the incident internally DECAPITATED. It’s an injury where the spinal column separates from the skull because of the forces of the accident. Having a child rear-facing supports their head in the forward momentum and keeps their skull attached to their spine. No argument with my child would be worth risking internal decapitation. I really can’t believe most people turn their kids around at 20 lbs and 1 year… the idea of that is startling to me. Lora, I was scared to death to let Big Guy out of his harness – and I did wait many months until after he was “legal” to do it. For one, I was afraid he’d decide to start unbuckling the seat belt just because he could quickly. He could manipulate his harness toward the end as well, but for some reason it never occurred to him to do it while we were moving. For another, there’s the loose-belt factor you mentioned. That’s a huge one on the booster he has in Dad’s car, which is more awkward to buckle around the seat back, though the one in my car is easier to secure. Boots, on the other hand, might remain in a harness until he’s 30. He already tries to get out of it now – thank heaven he can’t get the whole thing unfastened yet. I shudder to see what he’d try with a belt and booster. He’d be hanging out the car window like a dog. Tanya, mine will definitely remain in boosters until they’re 8/80, too. Maybe longer, because they’re both short and likely to remain so. Big Guy is balking already because he sees older cousins without boosters and riding in the front seat far earlier than is legal here. I know I’ll need to invoke my “different parents have different rules, and these are our rules” on this one. So be it!